I told my friend I didn't want to be friends anymore, now she is sending me hate-mail. What should I do? I already blocked her from everything and I told my parents. Sounds like your friend is being a bit of a cyberbully. Cyberbullying is the use of technology to harass, threaten, embarrass, or target another person. Online threats or "flames" (rude texts, IMs, or messages) count. So does posting personal information or videos designed to hurt or embarrass someone else. Because of the role technology plays in our lives, there is often no place to hide from bullies. Online bullying can happen at home as well as school (even in the coffee shop or anywhere else people go online). And it can happen 24 hours a day. Sometimes, online bullying, like other kinds of bullying, can leave people at risk for serious problems: Stress from being in a constant state of upset or fear can lead to problems with mood, energy level, sleep, and appetite. It can also make someone feel jumpy, anxious, or sad. It's not just the person being bullied who gets hurt — the punishment for cyberbullies can be serious. More and more schools and after-school programs are creating systems to respond to cyberbullying. Schools may kick bullies off sports teams or suspend them from school. 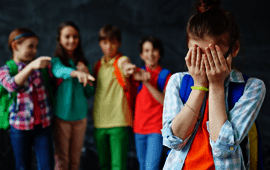 Some types of cyberbullying may violate school codes or even break antidiscrimination or sexual harassment laws, so a bully may face serious legal trouble. Why would someone be a cyberbully? There are probably as many reasons as there are bullies themselves. Sometimes, what seems like cyberbullying may be accidental. The impersonal nature of text messages, IMs, and emails makes it very hard to detect a sender's tone, and one person's joke could be another's devastating insult. Most parents are so concerned about protecting their kids that sometimes they focus on taking all precautions to stop the bullying. If you're being bullied and worry about losing your Internet or phone privileges, explain your fears to your parents. Let them know how important it is to stay connected, and work with them to figure out a solution that doesn't leave you feeling punished as well. You may have to do some negotiating on safe cell phone or computer use — the most important thing is to first get the bullying under control. You can also talk to your school counselor or trusted teacher or other family member. If the bullying feels like it's grinding your life down, counseling can help. If you're not ready for that, you can still benefit from the support of a trusted adult. Although it's not a good idea to respond to a bully, it is a good idea to save evidence of the bullying if you can. It can help you prove your case, if needed. You don't have to keep mean emails, texts, or other communications where you see them all the time — you can forward them to a parent or save them to a flash drive. Be safe online. Password protect your cell phone and your online sites, and change your passwords often. Be sure to share your passwords only with your parent or guardian. It's also wise to think twice before sharing personal information or photos/videos that you don't want the world to see. Once you've posted a photo or message, it can be difficult or impossible to delete. So remind yourself to be cautious when posting photos or responding to someone's upsetting message. If you see a friend acting as a cyberbully, take him or her aside and gently talk about it. Perhaps there's a reason behind the bullying and you can help your friend think about what it is. Or, if you don't know the person well enough to talk about feelings, just stand up for your own principles: Let the bully know it's not cool. Explain that it can have very serious consequences for the bully as well as "bystanders" like you and your friends who may feel stressed out or upset about what's going on.